FREE DETECTIVE MYSTERY ON KINDLE NOW! A woman’s body is found floating face down in Heaton Park Boating Lake. Her throat has been cut, with flowers strewn around her. When an obvious suspect is found murdered in an even more grizzly fashion, the case becomes stranger still. Detectives James Francis Dineen and John Moreland must find the killer, and the answer may just be found in a painting. Set in the Manchester of 1912, this detective story is an engaging tale of love gone wrong between rich and poor, the perils of prejudice, and a twisted murderer with a point to prove. 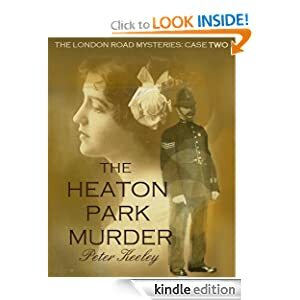 The Heaton Park Murder is the second of Peter Keeley's London Road mysteries, stories from the casebook of James Francis Dineen. It will appeal to all fans of early 20th century detective fiction. Look out for further adventures on Amazon soon.